For many of us, the fall season brings on a sense of anticipation. Anticipation for cool, crisp afternoons, the changing of the leaves, boot season, and more. However, fall also ignites a feeling of excitement — not the kind of excitement summer holds, but an excitement for days spent cozied up in your favorite blanket, hot apple cider in hand, and a wonderful view of Mother Nature’s natural beauty. For me, fall time always reminds me of the Danish word hygge. As Hygge House explains, “While there’s no one English word to describe hygge, several can be used interchangeably to describe the idea of hygge such as coziness, charm, happiness, ‘contentness’, security, familiarity, comfort, reassurance, kinship, and simpleness.” The moment where you feel almost frozen in time, content with nature and yourself—that’s hygge, and fall is the perfect opportunity to enjoy more of these precious, comforting moments. So here’s how to Hygge! What’s more comforting than snuggling close to a crackling fire? If you’re one of the lucky people to have a fireplace in your home, getting cozy can be made easy. Of course, it’s important to remember essential fireplace safety precautions before snuggling up with your favorite book. If you find your fireplace is all but forgotten about, consider hosting a BYOW (bring your own wood) housewarming party. Be sure to give it a good inspection first and clean it if necessary. If you have a home sans fireplace, fall presents the perfect opportunity for a bonfire with loved ones. Search around the local area and see if you can find a safe, secure spot to start a fire and then pack along some chairs, blankets, and of course, marshmallows. If all else fails, you can never go wrong with a few candles sprinkled throughout the house. They provide that soft illumination that can take your fall evening to the next, hygge-inspired level. Gratitude is a difficult art form to master. Not to say you aren’t thankful for the many positives in your life, and the mistakes that led you to where you are today, but we live in a world of more, more, more. Scrolling through social media has a tendency to ignite feelings of envy, desire, and want for what you don’t have. While it’s important to have goals, practicing gratitude can really conquer those feelings of “never enough” which creates that therapeutic hygge effect. 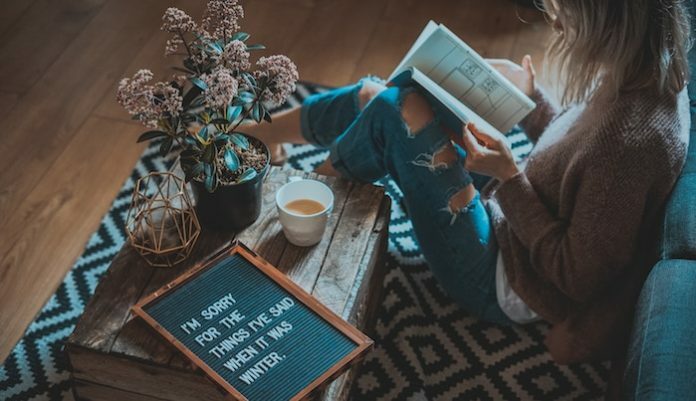 As experts at Healthline further explain, “Rather than setting aside time to practice mindfulness or meditation, [hygge] focuses on gratitude and indulging in the soothing things that we already have around us. While this itself won’t solve wider issues, it does force us to reassess whether we’re gliding through life trying to please everyone else or indulging in our senses and nurturing self-care.” While it might be easier said than done, stopping to reflect can bring a stronger sense of comfort within your everyday life, which means less time stressing and more time enjoying everything fall has to offer. Comfort often comes from a lack a stress, right? So what stresses you? What stands in your way of reaping the benefits of hygge? It might be your job, school, or the clutter in your bedroom or office. It can be multiple things. Hygge emphasizes simpleness, meaning it might be time to consider a more minimalist lifestyle. Of course committing wholeheartedly overnight is nearly impossible, but there are some simple ways to begin committing to a more organized, minimalist way of life. You can also ease into minimalism by starting with one room at a time in your home. The bedroom tends to be a good and effective place to begin as we tend to spend the most time there. Consider taking a few weekends to create a minimalist bedroom and move on from there. Taking a page from the Danes’ book, everyone can certainly benefit this fall from practicing the hygge philosophy. Of course, it’s not just for fall, but fall certainly has that magical way about it, inspiring joy within the little things, making it the perfect time to start your hygge journey.